It’s the age-old question. Which actor would play (insert sports figure here) in the biopic of their life? In honor of Al Pacino being selected to play Joe Paterno in the upcoming HBO film about the Penn State sexual abuse scandal, CBS Sports pieced together a list of famous actors and their college football coach counterparts. There are some pairings you would expect, like Ryan Gosling as Kliff Kingsbury and Rob Riggle as Bret Bielema, and then there is one that will make Texas fans’ skin crawl. Would the Longhorns’ most famous superfan really don a different shade of orange to play a character, even one as compelling as Dabo Swinney? Even we have to admit, though, it would be a pretty good fit. 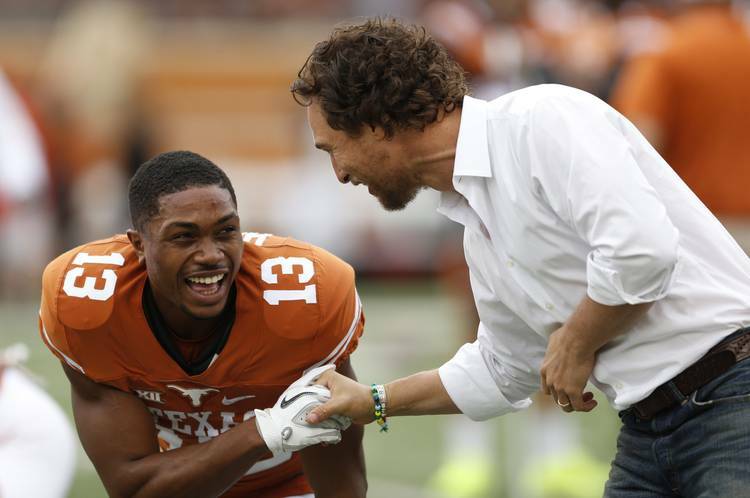 So who would play Tom Herman, you ask? CBS didn’t include the Texas coach on its list, which means we’ll just have to come up with someone ourselves. Since McConaughey is taken — and let’s be honest, he’s a little too Texas to play the California-raised Herman — here’s who we came up with. Mat Damon attends the “Rei Kawakubo/Comme des Garcons: Art Of The In-Between” Costume Institute Gala at Metropolitan Museum of Art on May 1, 2017 in New York City. He’ll have to lose the Boston accent for this role, but he wouldn’t have any trouble pulling off Herman’s outsized personality. Plus, Herman’s rise through the coaching ranks from obscurity smells a little of “Good Will Hunting.” The movie creators would probably have to pay Dave Campbell’s Texas Football Magazine for the right to recreate this year’s cover photo. Texas coach Tom Herman has been placed on the cover of Texas Football Magazine. A Longhorn last appeared on the annual magazine’s cover in 2009. Have any better suggestions for Herman? Been sitting on the perfect idea for a Mack Brown movie? Let us know in the comments.